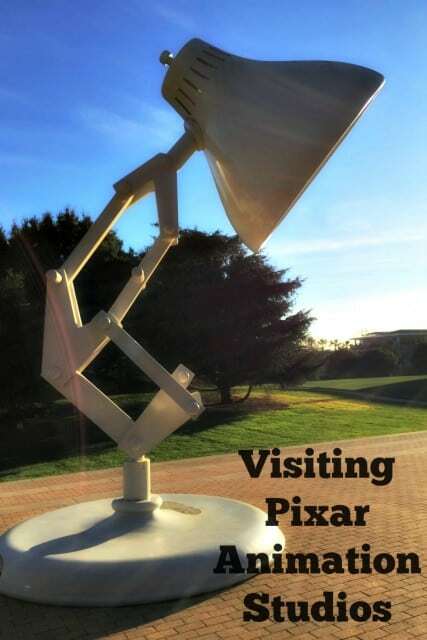 I had the opportunity to visit Pixar Animation Studios. How awesome is that. I love Pixar movies. Really, I think every person in the whole world loves Pixar Movies. Not only are they beautiful to watch, the story is amazing and we all fall in love with the characters. I was excited to visit Pixar Animation Studios so I could see where some of my favorite movies came to live. This was such a fun experience and they do such a great job at making the environment and fun place to visit. I think this would be such a fun place to work! We were all very excited when we first arrived at the gates of Pixar Animation Studios. We all attempted to takes photos out the window while the bus was turning in but mine ended up only showing the AR Studios. I still excitedly texted it to my husband who was eager to follow along with my trip and he thought it was awesome. Luckily though, we had the opportunity to climb out of the bus and get a real picture. 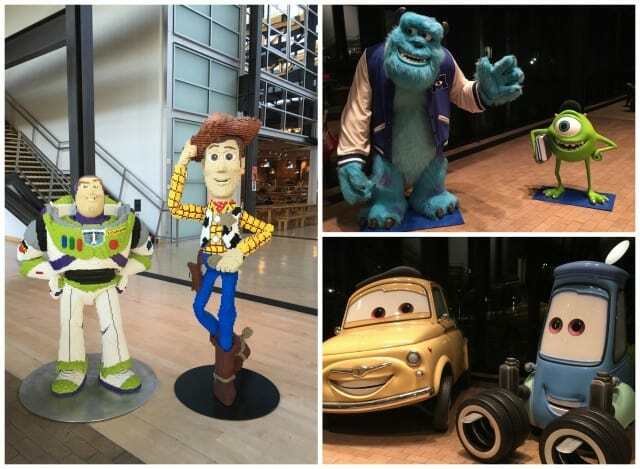 Welcome to Pixar Animation Studios. So awesome. I spend my high school years in the Bay area so it was so nice to be “home.” The weather was beautiful and it was nice to spend a few moments outside seeing the beautiful campus. The building shown above is the Steve Jobs Building which is where we spent our time. 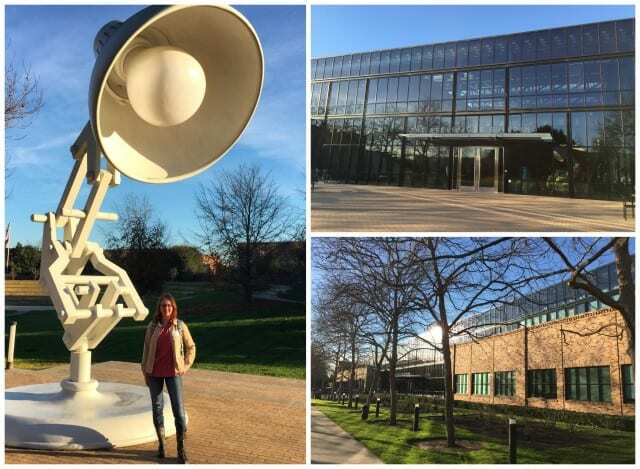 We definitely had to take time to get a photo in front of the large Luxo Jr Desk Lamp in front of the building. This was really fun to see at night because the lamp actually turned on. Inside the building definitely didn’t disappoint with many of these fun life size Pixar characters. This is the moment that I wish my kids could have been with me because they would have loved seeing these characters and would have insisted getting their photos taken with all of them! 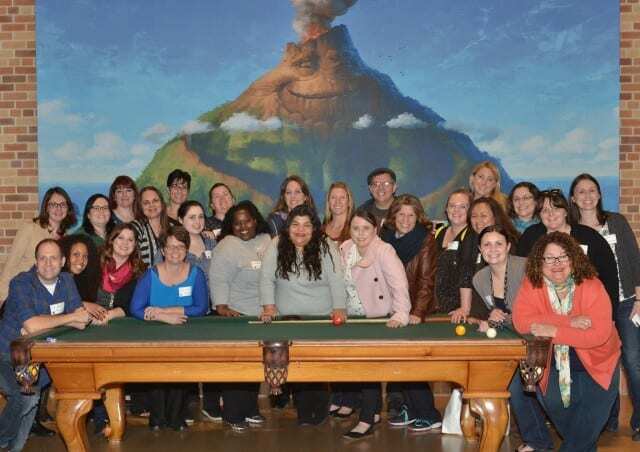 While at Pixar Animation Studios we had the opportunity to interview Director Pete Docter and Producer Jonas Rivera. The interviews are always my favorite part. This is the time we get to fall in love with the film because we get to learn about all of the love that went in to making the film. 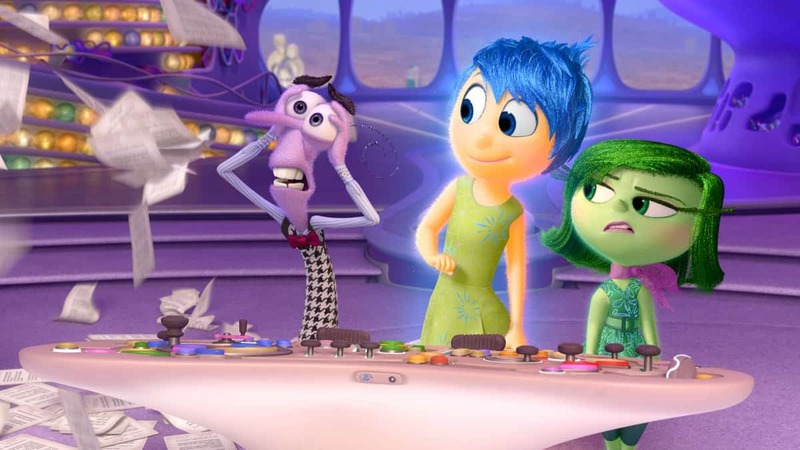 Inside Out is no different. The Pixar team were passionate about this film and they put so much love and hard work into making it. They had the idea of using emotions as their main characters so as part of their research they talked to psychologists and neurologists, and really dove into how and why we think and feel. These movies take a long time to make. Bill Hader’s wife had three kids while they were making this movie! It is about 4-5 years to complete a movie. Final sound mix for the movie was done at Skywalker Ranch. Michael Giacchino was the composer and both the director and producer loved the score. Emotions can make something even as simple as a family dinner, a little more complicated. Pete Doctor’s favorite emotion to bring to life was Anger because he was a fun Cartoon. The hardest was Joy because she is the lead and he wanted her to have depth. While at Pixar Animation Studios we also had the opportunity to screen the new short film Lava that will play before Inside Out in theaters. 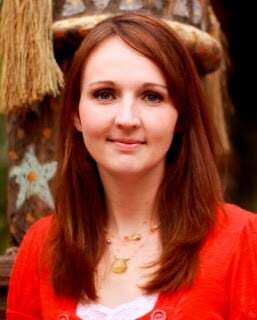 We also had the opportunity to interview Director James Ford Murphy and Producer Andrea Warren. Can I just say that I Love Love Love Lava! Like beyond love it. I grew up in Hawaii. I remember spending holidays and friends houses and we would hang out while they played the Ukelele. This short film is special. It is beautiful and it fills me up with so many of my favorite memories. We had the opportunity to sit in the room as the Director James Ford Murphy played and sang on the Ukelele and it just felt at home. You will love this short film. It has so much love, is beautiful to look at and I can’t wait to watch it again and again. 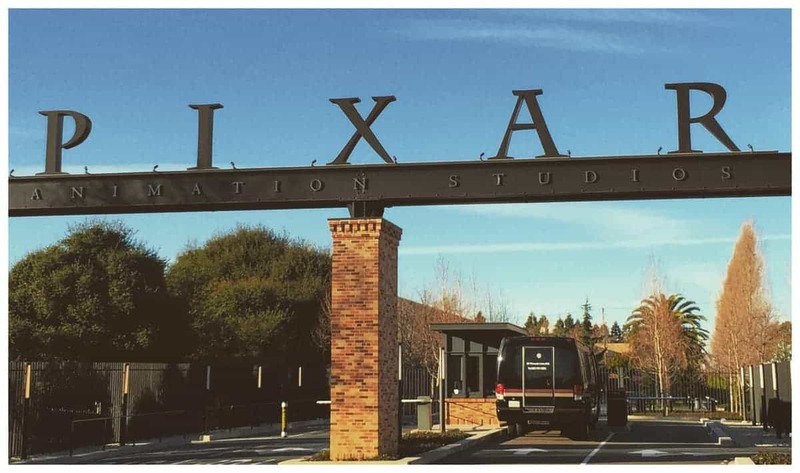 Anyone at Pixar can pitch ideas for Short Films. They have to submit three ideas. The Director likes to create stories about things that he really loves and things that he connect with emotionally. Every since he was a kid he had a tremendous fascination with Hawaii and Volcanoes. 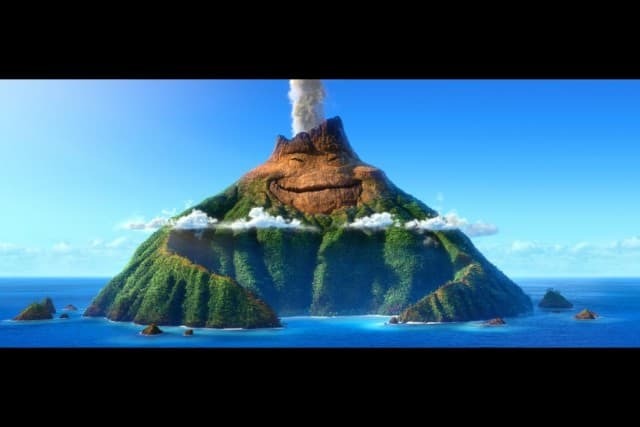 “When it came time for me to come up with an idea for a Short Film I thought, well I have this love of Volcanoes and this love of Hawaii and Hawaiian Music, what if I could write a song that makes me feel the way that that song did when I first heard it and feature it in a Pixar Short.” And from that came Lava! Every time he pitched the idea he would sing and play the Ukelele. He visited a Music Festival and Awards Festival in Hawaii where he found the two singers for the short. The singers that he chose, Kwana Torres Kahele and Napur Grey, actually ended up having grown up together. As I mentioned above, I LOVED Lava. I am so excited for you to see it. I think because of the personal connection that I have it is probably one of my favorite shorts that has ever come out. 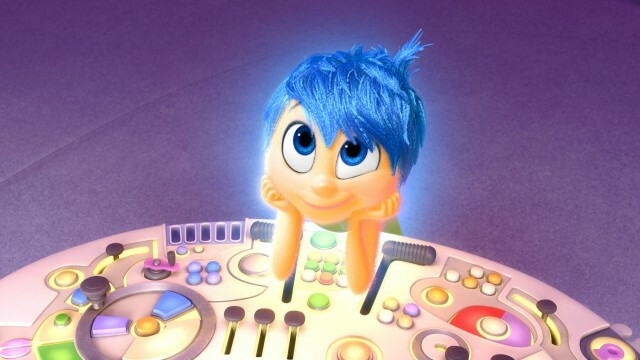 You can see it in theaters on June 19th before Inside Out! Thank you, Thank you, Thank you again Disney for this amazing opportunity. I received an all expense paid trip to San Francisco for this event in exchange for sharing my experiences with my readers.